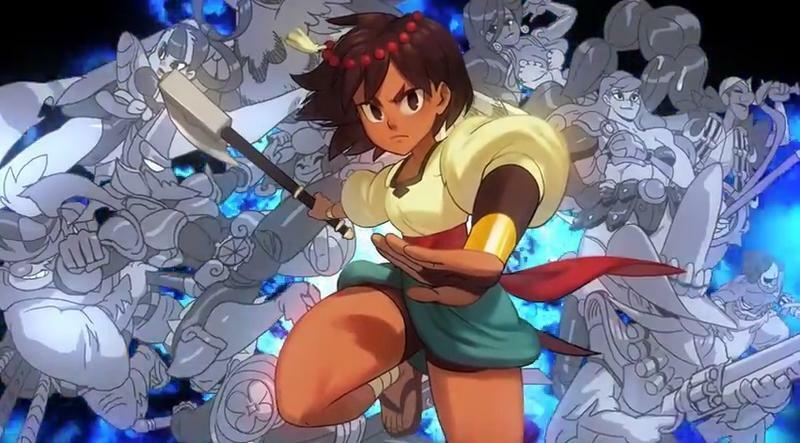 Lab Zero Games, the company behind the indie favorite fighter SkullGirls, is well into development on its sophomore project, Indivisible. Jumping from a fighting game into a full-blown JRPG is no easy feat, but the battle system borrows straight from Lab Zero's previous experiences, making the transition obviously a lot smoother. What I mean by that is the battle system looks to be ripped straight from a fighting game. Indivisible obviously borrows a few ideas from Valkyrie Profile, using a side-scrolling viewpoint, commanding characters with a single button command like Super Smash Bros., attempting to rack up points through a combo system. The only difference is that where Valkyrie Profile used pixelated sprites to get its job done, Indivisible uses the same quality art style that helped SkullGirls became such a hit. Essentially, your party functions as a single, customizable fighting game character – the key to success is mastering your party's attacks to create combos, and experimenting with new Incarnations and attacks to make the most out of every round. However, unlike Valkyrie Profile, Indivisible's battles are not strictly turn-based. We're taking a more active approach, where characters can attack any time they have actions available. Actions recharge in real time for you and your enemies, so waiting for more characters to be able to act at once allows for bigger combos and gives you more strategic options, but also leaves you open to attack from your enemies. I like what I see so far, but even more so, I love what I hear. Lab Zero Games nabbed Secret of Mana composer Hiroki Kikuta to write the game's music, and his touch on the soundtrack is more than obvious to fans. This is another indie to check out folks, and the studio is a proven one at that. Put this on your radar.